UnionPay International is launching its new Facebook page and exciting new video at a special event at Junction City on Tuesday 9th of October. It promises to be a great day out and you’re invited to take part in the festivities! You’ll also be able to find out more about MI Radio’s new MI Helping Hand charity initiative. We’d love to see you there on Tuesday and tell you more about it. You can drop by any time as we’ll be there all day. You’ll also be able to help people in need immediately, with two ways to contribute. Bring clothes, books, and no-longer-needed items to donate to the MI Helping Hand charity at the event. We’ll also make regular collections to help those less fortunate than ourselves who need a Helping Hand to make life a little easier. And check out this other great way to help - during the event you and your friends can sing a song on stage and MI Radio will make a donation on your behalf to the MI Helping Hand charity for every song that’s sung – yep, that’s right, your singing talent will help people in need in a very direct way, that’s pretty awesome, right? You can also send us a recording of you singing your favourite song as an MP3 or WAV file or record it on your phone and post it to the MI Radio Facebook page. 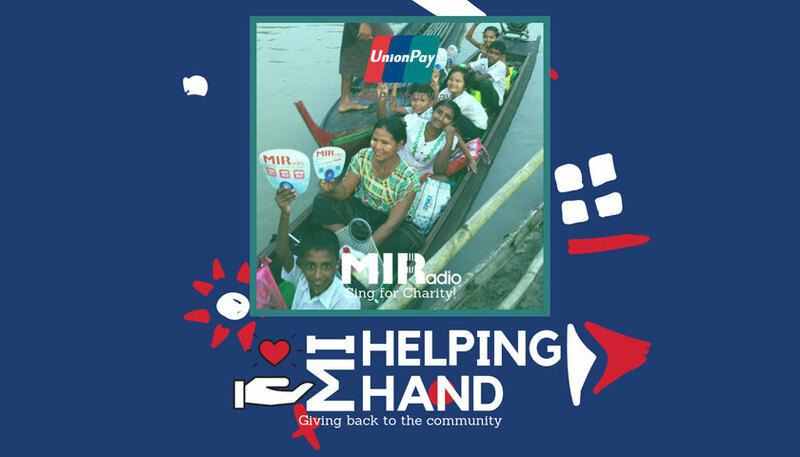 We’ll put the best ones on the airwaves across Myanmar, and MI Radio will also donate 5000 MMK to the MI Helping Hand charity for every song chosen for broadcast! So, join the other MI Radio listeners at the event on Tuesday and let’s give something back to the community and work together to help those in need.